Different things can draw people to participate in meal preparation. In the kitchen, there’s really something for everyone! Take a look at some of the examples below to find strategies for getting your kids involved with family meals. The builder is like the engineer. She or he may become enamored with kitchen gadgets and equipment that does a specific job, so make the builder’s gadget requests and use a part of your time in the kitchen. The artist, on the other hand, might not want to make a whole meal. Set him/her to work making an elaborate table setting, a beautiful plate for the main meal, or a pretty salad. Plating meals can be fun for artists too, especially if you have sauces in squirt bottles, ready to be “painted” on the plates. Let the musician listen to music while cooking or choose the music that is played during dinner! Have kids who are interested in writing make lists of meal ideas, write recipes, or create their own cookbook. Allow the aspiring chef as much freedom in the kitchen as possible. 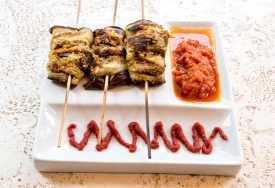 You may be amazed at some ingredient combinations or gourmet preparations. Give the gardener opportunities to grow herbs or vegetables for the kitchen. The shopper might like to buy pots and pans, kitchen equipment, plates, or neat produce at the farmers market. The social butterfly might like inviting friends to dinner and posting pictures of meals on Facebook. 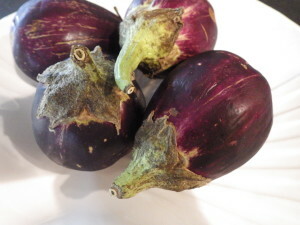 I recently got the best gift from a friend — 4 small eggplants from her garden. This is the same friend who brought me several pomegranates a couple years ago. I feel so lucky that I have friends that bring me wonderful fruits and vegetables — what great gifts! Anyway, back to the eggplant. I don’t usually buy eggplant, largely because I really don’t know what to do with it. My husband likes eggplant Parmesan, but he usually orders it in restaurants. I’d heard so many rumors and old wives’ tales about how to cook eggplant, and found myself baffled by all the conflicting information. For example, do I need to salt the eggplant? I remember my husband’s aunt always salting her eggplants and then weighing them down with books. On the other hand, according to an archived article from Food and Health Communications, you don’t have to bother with this if the eggplants are very fresh. So how should I treat my eggplants? Since salting can help remove the bitterness from an eggplant, I decided to salt mine. 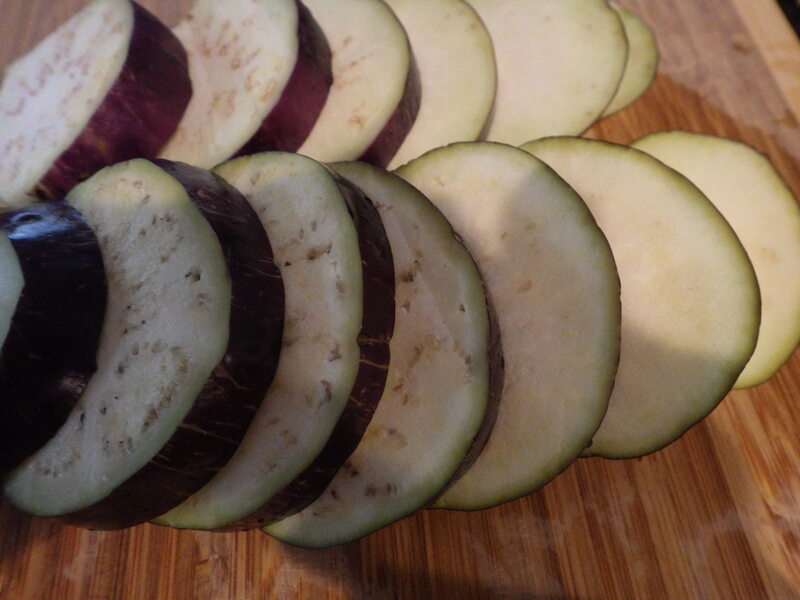 If you’d like to salt your eggplants before you cook them, first you need to slice or dice the eggplant into the shape you want to use. Sprinkle everything with about half a teaspoon of salt (not the half cup my husband’s aunt used to use) and then let everything sit in a colander for 30-60 minutes while the eggplant drains. Once that time is up, press out any excess liquid and dry the eggplant with a clean towel. 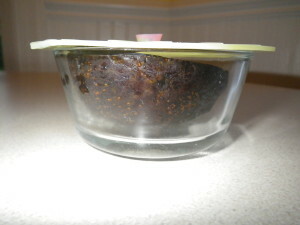 You can also rinse the eggplant to remove extra salt before drying it. So, there I was with salted eggplant. How did I want to cook it? With time running short, I decided that I wanted to preserve my eggplants to cook later. 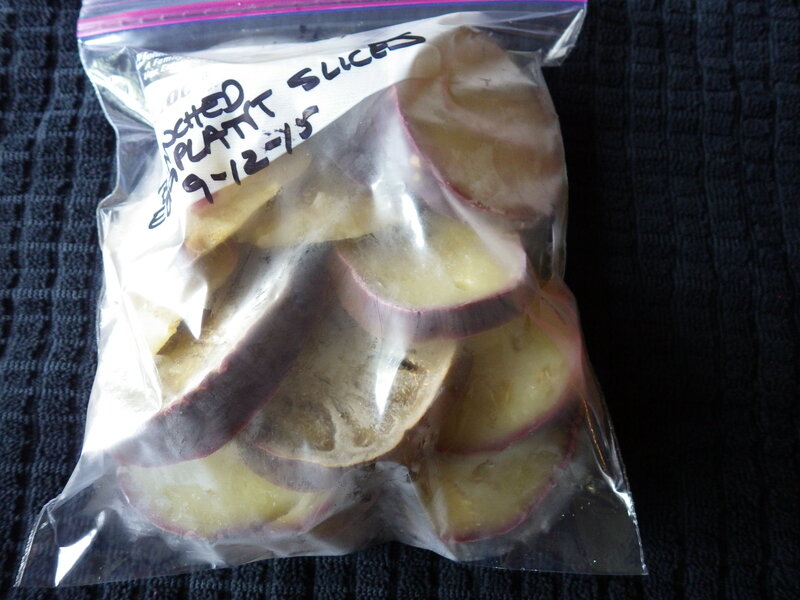 According to the National Center for Home Food Preservation, eggplant can be frozen. As far as I could tell, there is not a research-tested recipe for safely canning eggplant. To freeze eggplant, fill a large pot with 1 gallon of water and half a cup of lemon juice (the lemon will keep the eggplant from darkening). Bring the mixture to a boil. While you’re waiting for the water to heat up, wash, peel, and slice the eggplant into discs that are half an inch thick. 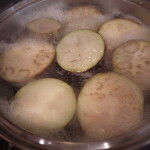 Since eggplant does discolor quickly, prepare only what you you can blanch at one time. 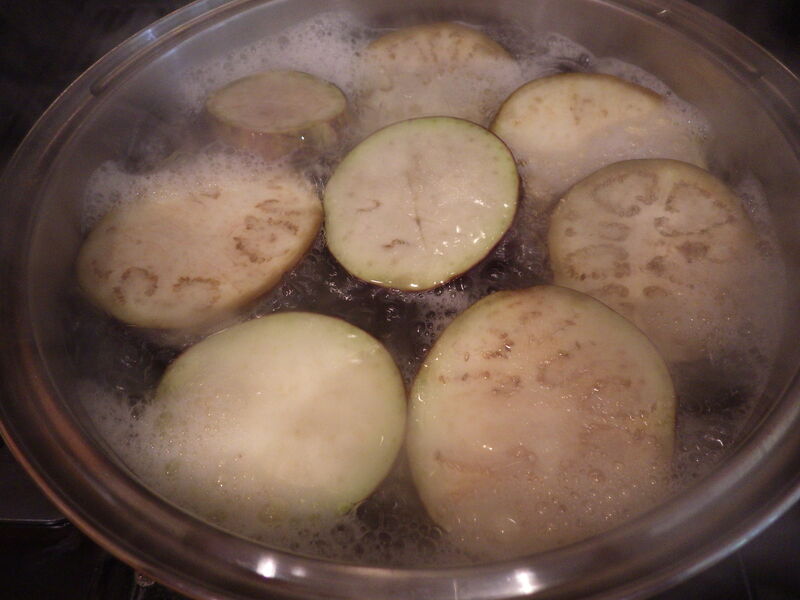 When you’re ready, place the eggplant slices in the boiling water for 4 minutes. 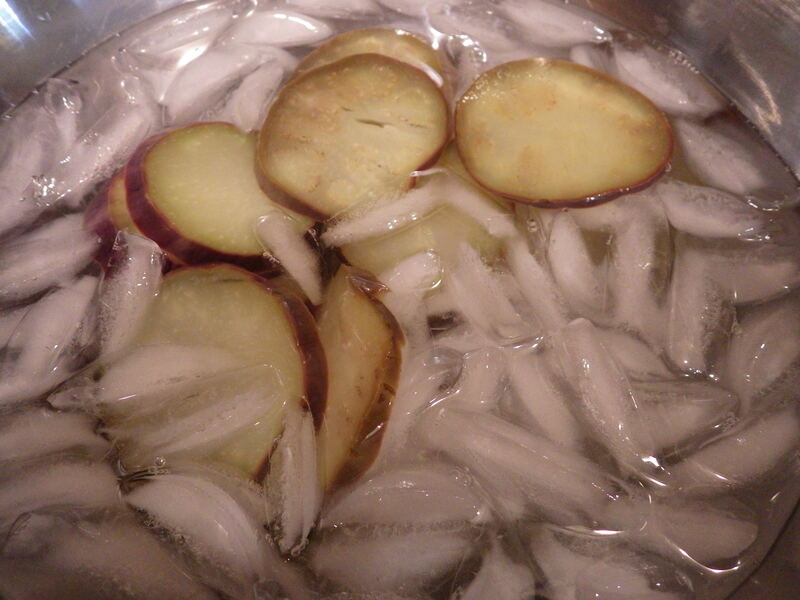 Pluck the slices out of the water with a slotted spoon and drop into an ice bath for another 4 minutes. Then drain and pack up your eggplant. If you want to fry the slices or layer them into eggplant Parmesan or vegetable lasagna, consider placing freezer wrap between the slices before freezing. That’s basically what I did, with one little twist. I put the well-drained eggplant slices on a tray and froze them individually. Then I transferred everything to a freezer bag. Hooray! Now I have two quart bags full of sliced eggplant for later this year! 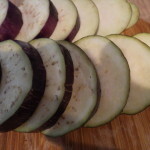 To avoid browning, wait to cut into the eggplant until you absolutely have to — don’t prep that part a few hours in advance! Leave the skin on! This will help color, shape retention, and optimal nutrition. You can find anthocyanins in the purple skin of an eggplant, and since anthocyanins have a positive impact on blood lipids, it would really be a shame to remove the skin. Eggplants do have a tendency to soak up oil during cooking. To keep your dish light and healthful, sauté eggplant in a small amount of very hot oil in a nonstick pan. Want a quick eggplant side? Spray slices with olive oil cooking spray and roast, grill, or broil them. Anyway, that’s a brief recap of my eggplant adventures. I hope you liked it! Here’s a handout that features the most helpful points from today’s post. Get your copy today! 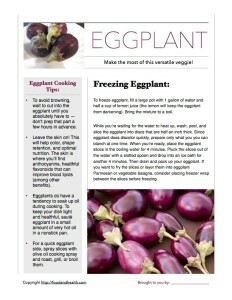 And for more fun with eggplant, drop by the Nutrition Education Store! I’m giving my age away a little, but I remember an old Johnny Carson monologue (Hint for people under 40: he’s the guy on the Tonight Show before Jay Leno). It was the Tuesday before Thanksgiving and Johnny asked the audience if they had placed their frozen turkey in the refrigerated to thaw. He then concluded that if they hadn’t they might as well cancel Thanksgiving. It really isn’t that drastic an issue; there are other options for thawing that bird. It is amazing to me the problems people seem to have with a frozen turkey and the many creative ideas I’ve heard over the years for getting it thawed in time. Let me set the record straight. It is not safe to thaw a turkey in the trunk of your car, in the garage, basement or clothes drier. 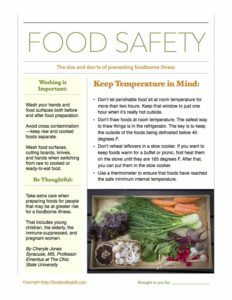 Even though the turkey may stay frozen on the inside as it thaws the outside is exposed to the temperature danger zone and this might result in a food borne illness. The very best way to thaw a turkey is in the refrigerator. So, Johnny was right, if you don’t get it in the refrigerator soon enough it won’t completely thaw using this method. You can also defrost in cold water, but this takes a lot of time, attention and water. 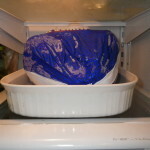 This method can also be used to finish thawing the turkey that was only in the refrigerator for a day or so. 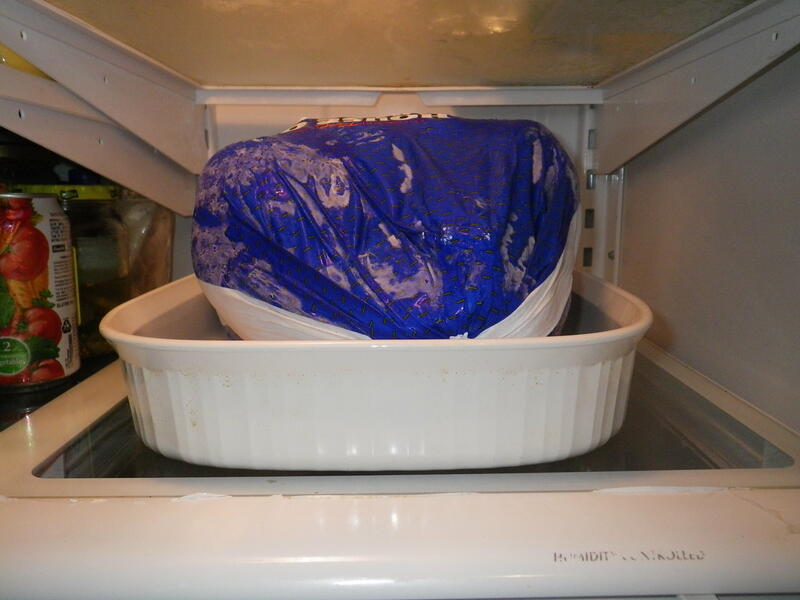 Place the turkey in a leak-proof bag in a clean sink and submerge in cold water. This water needs to be changed every half hour. The reason for this is the water needs to be kept under 70 degrees the whole time to keep the outside of the bird cold. It takes about 30 minutes for each pound, so your 25 pound turkey would have you changing water for 12 ½ hours. If you have a smaller turkey, it could be thawed in the microwave, but it needs to be cooked immediately after thawing. You could cook the turkey directly from the freezer. It will take about 50% more time. So your 25 pound bird would take you about 7-7.5 hours to roast, and it won’t be stuffed. If you do this method, you could carefully take the frozen pack of giblets out during the roasting when the bird becomes thawed enough. Then throw them away. You’ll need to use a thermometer to assure the turkey has reached at least 165 degrees before serving. Do not try to deep-fry a frozen turkey. If you really are having trouble finding space to allow a frozen turkey to defrost in the refrigerator for several days, you may consider purchasing a fresh turkey and picking it up just before the holiday. But you’re still going to need to find room for it in the refrigerator unless you start to roast as soon as you get it home from the store. Johnny was right-on-the-money with many of his smart quips…but a frozen turkey on Thanksgiving morning is not a reason to cancel the whole dinner. It just might be a little late. Kids love Halloween, costumes and carving pumpkins. 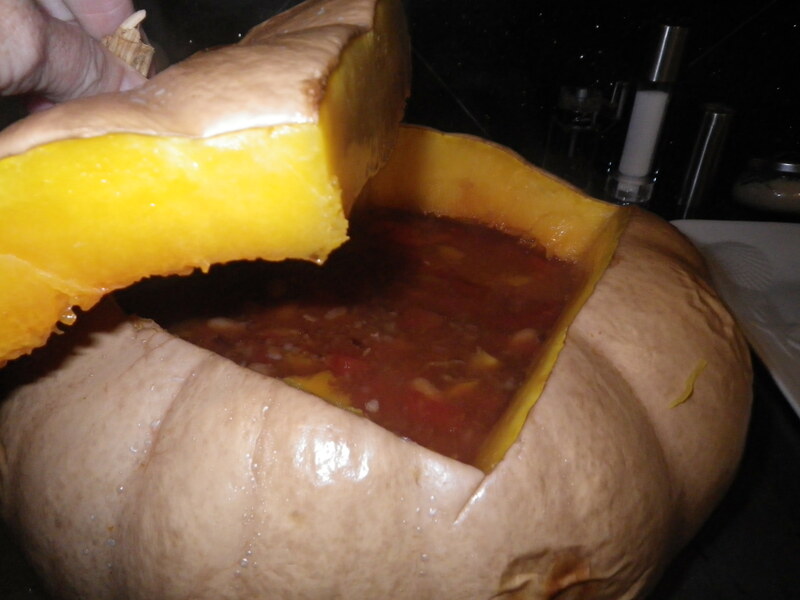 Extend the fun by serving dinner in a pumpkin. This meal could be made ahead and served before the goblins go out trick-or-treating or have it in the oven while passing out treats at home. I made this for family friends a couple of years ago and they still talk about the time I put a pumpkin on the table. Get the kids involved in this meal. Make it a family outing to select the pumpkin or pumpkins. The large round pumpkins that make great jack-o-lanterns are not the best for eating, they are usually stringy and tasteless. 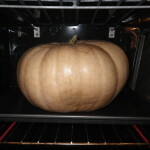 Smaller flatter pumpkins are best for cooking. Look for sugar, pie pumpkin or cooking pumpkins. I could only find small orange pie pumpkins at our farmer’s market. There was also a hybrid pumpkin variety called a Buck Skin. This was a tan on the outside rather than orange but bright orange inside. This is one of the varieties of pumpkins used by commercial canneries use to make canned mashed pumpkin and pie filling. So, it’s a great eating pumpkin. A word of caution when it comes to selecting pumpkins to fill for a meal. Don’t get one that’s too big. It might not fit in your oven or may be too heavy once filled. If you can’t find a nice medium-sized cooking pumpkin, you might want to go with individual smaller pumpkins. Everyone could have their own pumpkin for dinner. It may be tempting to try to do “double duty” with a pumpkin, to first have it as a jack-o-lantern and then make it into a pie. Let’s not go there. Like any other food, once it has been cut, pumpkin needs to be kept refrigerated. You should plan to eat or refrigerate pumpkin the same day you cut into it. You could use the whole pumpkins for yard decorations, just don’t cut them until you’re ready to cook them. The bright orange color is a dead give-away that pumpkins are full of important nutrients and antioxidants and beta-carotene. Pumpkin is an excellent source of vitamin A, which is an essential nutrient for proper health of eyes, respiratory tract, skin and tooth enamel. Make a recipe of your favorite soup, chili or meal-in-one casserole. Cook that recipe almost complete. Wash the outside of the pumpkin. Cut off the top as if you were making a jack-o-lantern and thoroughly clean out the seeds and strings, leaving the pumpkin shell. This can be a great job for the kids. Preheat oven to 350 degrees. Spoon the hot filling into the cleaned pumpkin shell, replace pumpkin top and place entire pumpkin with filling on a baking sheet in oven. 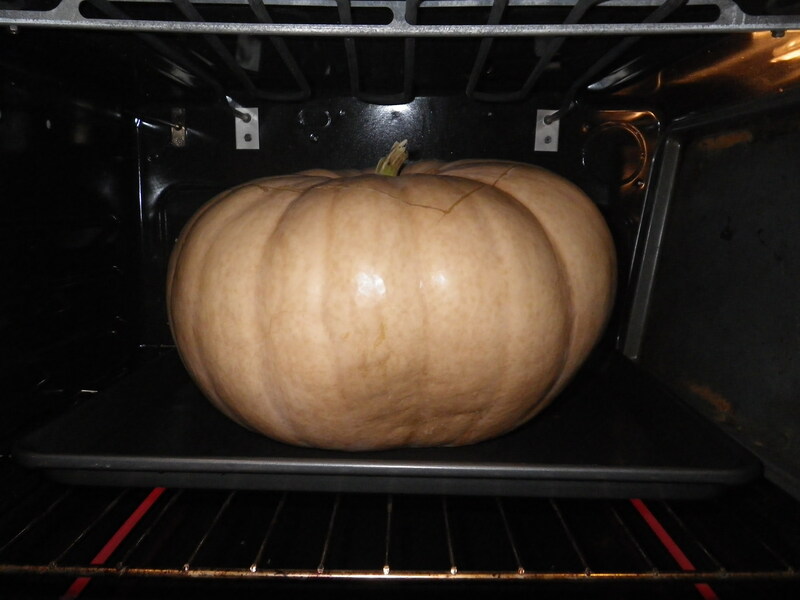 Bake for 1 hour or until pumpkin is tender. Carefully place the pumpkin on a serving platter (this may be difficult or impossible if your pumpkin is very large.) Remove the pumpkin lid and serve the contents. 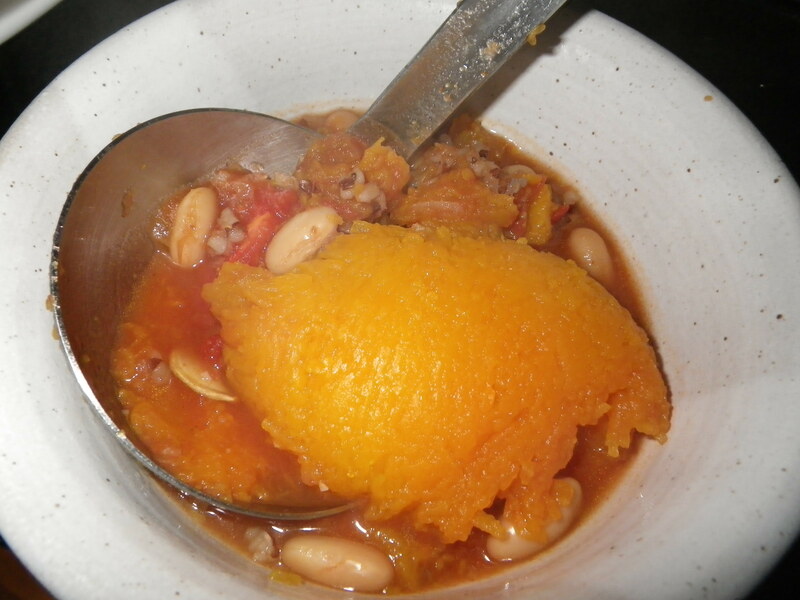 For your vegetable, scoop out the cooked pumpkin and serve. Add a cold glass of milk and toasty bread and this provides a complete meal. 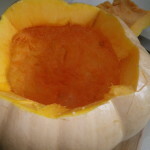 The soup, chili or casserole should be hot and almost completely ready to eat when put into the pumpkin shell. 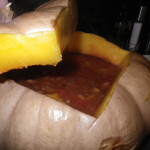 Do not put raw ingredients, especially meats or poultry into the pumpkin shell, the heat will not penetrate the hard shell enough to cook these items. 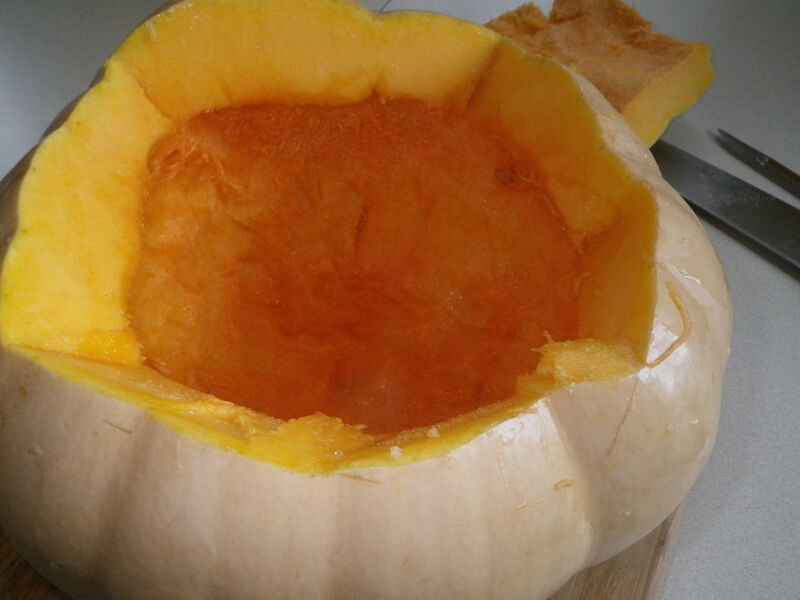 Ingredients such as rice that need a long cooking time should be almost tender when placed inside the pumpkin. After the discussion on mangos being the most consumed fruit in the world I realized I didn’t know as much about this fruit as I thought. So I did some additional research. While it might be the most eaten fruit in the world, it’s still far down the popularity list in the United States. According to a 2012 study by Fresh Facts Shopper Insights found at www.mango.org mangos are only purchased by 14% of the households in the US. To compare this with other fruits: bananas have an 85% market penetration and apples 71%. When looking at “mainstream fruits” purchased, mangos fall below bananas, apples and grapes but above pineapples, kiwi and papaya. Mango buyers typically purchase them 2-3 times per year. The strongest buyers are “foodies”, natural/organic shoppers and Hispanic shoppers. Mangos grow in frost free climates which is why Hawaii, Florida and California are the only states in which they grow. They must have warm dry weather to produce fruit.They are native to Southeast Asia and are considered a staple in India, China and the Philippines. Mangos have two seasons and different varieties are available at different times of the year so they are available year round. Mexico is one of the biggest suppliers of mangos to the US along with Haiti, Guatemala, Ecuador, Peru and Brazil. The size and shape of a mango differs based on variety. They can range in size from 6 -24 ounces. It is said that mangos with the best flavor are those that are allowed to ripen on the tree. But unless you have a tree in your backyard this is going to be difficult. The leathery skin of a mango is waxy and smooth. When ripe it can be pale green to golden yellow or orange marked with red. But color is not the best indicator of ripeness. Mangos continue to ripen off the tree if kept at room temperature. A ripe mango will give slightly and become softer as they ripen. When ripe the fruit will feel similar to a ripe peach or an avocado. To speed ripening place them in a paper bag. 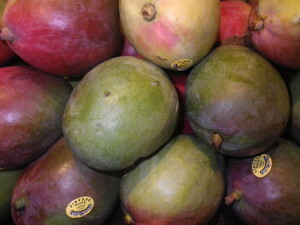 Ripe mangos can be refrigerated, but should be used within several days. 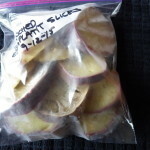 Once cut they will keep in an airtight container for a few days or up to six months in the freezer. The flesh of a mango is peach-like, juicy and in my opinion luscious. The large oval-flat husky stone/seed makes it difficult to cut or use. One of the best ways to cut a mango is to cut the fruit lengthwise just along the outside of the seed. This gives you two large portions of seedless fruit. I usually work to get a few more bites off the top and bottom of the seed. There is frequently inedible fiber close to the stone/seed. A high-quality mango will have minimal fiber, this is mostly due to the variety/cultivar and difficult to tell when selecting. Mangos are fat, sodium and cholesterol free. Nutritionally, one cup (165 grams-about 6 ounces) of mango chunks contains 100 calories and 3 grams of fiber, 35% of the RDA for Vitamin A, 100% RDA for Vitamin C and 20% RDA of folate. Mangos also contain copper, Vitamin K and Potassium. I’m now on a personal crusade to increase the consumption of mangos in the US. We’ve had them at least five times this year and I vow it’s going to be more. 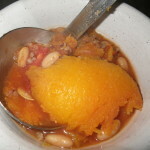 Here’s a great way…make your own mango salsa http://www.foodandhealth.com/recipes.php?id=482 Try it on fish! Some things are just hard to resist. For me they were silicone lids that look like flowers and plants. 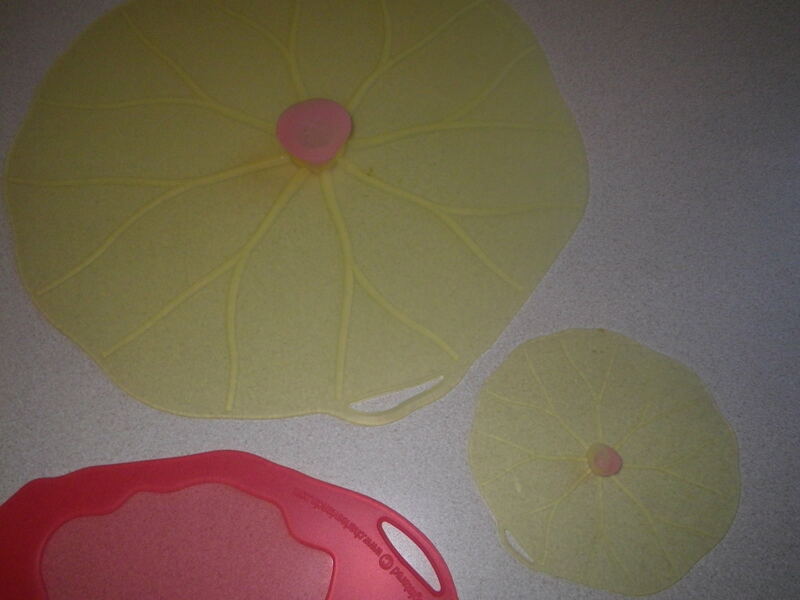 I originally saw them when a friend showed me her set shaped like lily pads. They looked very real to me. I searched several “upscale” kitchen gadget stores and finally found them for sale. These lids are made of silicone and seal tight on smooth rims of glasses and bowls. Not only are they pretty, but they create an airtight and watertight seal on glass, plastic and stainless steel. They are designed by Charles Viancin (www.charlesviancin.com). Let me be right up front with you. I don’t work for them. I do not get any money from them for writing about the lids. And, no, I did not get a discount or free product for writing this post. I paid full price—and they are not cheap! 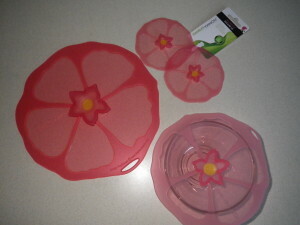 The large (11”) lily pad lid was $13.99. But, I think they are great and worth letting readers know about these cute and useful kitchen gadgets. 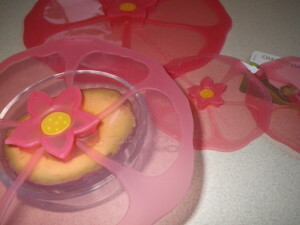 These silicone lids are designed to prevent spills and save on plastic wrap. They can be used in the refrigerated, freezer, microwave and even the oven (maximum 428 degrees F). They’re great for putting in the microwave to prevent spattering or on top of an irregular shaped bowl in the refrigerator. They look great and attract a lot of attention on the serving table. As a lid they can be washed over and over again (dishwasher safe, too). I like them for bowls and glasses that didn’t come with their own lids. 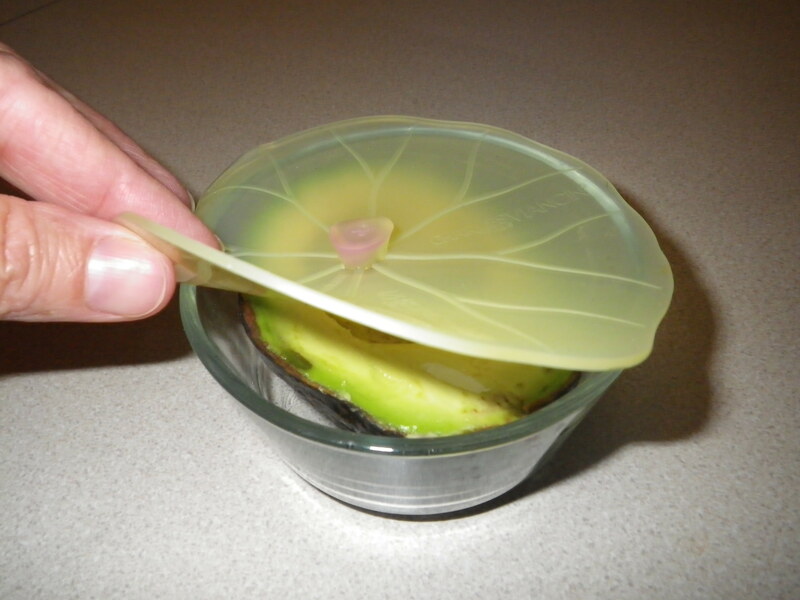 There are even large “banana leaf” lids that would fit and 8 ½” x 11” dish. The only problem I see with them is the small little knob in the center does not allow for stacking inside the refrigerator. I think they are a great gift idea, bridal showers or weddings or birthdays. I like to give people things that they might not spend the money for themselves. I loved them so much I bought a set of the pink hyacinth ones for my sister as a birthday gift. She loved them. Heavenly apple…or is it a pear? People that teach about healthful eating (me included) are always encouraging people to eat more fruit. I admit that after a while there’s not much excitement in eating another banana or apple—although I like them both. When I say treated myself, I mean it was a splurge, they are not cheap. A package of five was $6—making them over one dollar a fruit. I have to tell you, they were worth every penny. If you haven’t tried them I encourage you to do so. 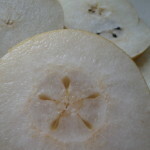 They are sometimes called Asian Pears or Oriental Pears. They are round like an apple and have skin like a pear. Flavor-wise they are a mix of apple and pear— sweet and fragrant. They are juicer than an apple and crisper than a pear. Delightful. Despite these mutual similarities, many people think they are a hybrid of these two fruits, but they are not. Technically they are classified as pears. While they are native to China and Japan, they are also grown in the Pacific Northwest of the US. Mine were from California. The skin can be golden brown, golden green, orange or brown—depends on the variety. Select Apple Pears as you would pick apples, they should be firm to the touch, not as soft as a pear. Take special care as they do bruise easily. Look for pear apples that do not have bruises or marks. They will keep for several months in a cool environment and can be held at room temperature for a week or so. 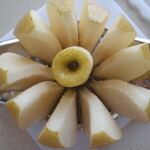 Nutritionally, one medium fruit has only 50 calories and it is completely fat-free with 13 grams of carbs and Vitamin C.
They have a beautiful white crisp flesh that doesn’t turn brown as quickly as an apple or pear when exposed to air….so they look great when featured in a salad or fruit bowl. They could be used in recipes designed for pear or apple, but my feelings are: they as so good just eating out-of-hand why bother? Most people say that they should be peeled before eating. I didn’t. 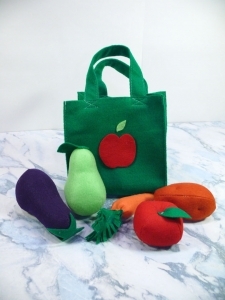 Looking for an activity to do with kids to teach them about eating more fruit? How about comparing the apple, pear and Apple Pear? Give them the chance to look at the similarities and differences in shape, color, texture and flavor. I’d be interested to hear the words they use to describe this fruit. I’m using the words: delectable, delightful and heavenly. 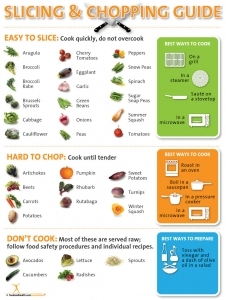 Boost Spring Fruit and Vegetable Consumption with Greens! One of the most important steps in cooking is planning ahead. That goes the same for your Easter eggs. This is a simple suggestion: buy your eggs this week. For easier peeling, eggs should be 7-10 days old. This isn’t rocket science. When an egg is fresh the white is very attached to the shell. As the egg gets a little older it starts to dehydrate. This forms a small air sac around the egg that helps to separate the egg membrane from the shell. Thus, when you hard cook the “older” egg it’s easier to peel. 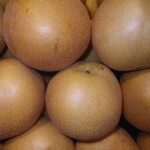 To help make peeling even easier, the American Egg Board (http://www.incredibleegg.org) says to peel the egg soon after cooling because cooling causes it to contract slightly in the shell. They also recommend to gently tap the egg on the countertop until the shell is finely crackled all over. Then roll the egg between your hands to loosen in the shell. Start peeling at the large end. Holding the egg under cold running water helps ease the shell off. I know there are lots of suggestions out there on what you can do to help make peeling an egg easier…everything from putting pinholes in the shell to adding vinegar or salt to the water. But none of these ideas really work and some may actually allow bacteria to enter the egg. The best bet is to plan ahead and use just a little “older” eggs. A quick food safety reminder: age does count after the eggs are cooked. Hard cooked eggs should be stored in the refrigerator and eaten within a week. Speaking of hard cooked eggs. I have a personal “pet peeve”. I know it’s semantics or just me being picky, but it really bugs me when people say “hard-boiled eggs”. I always try to say “hard-cooked eggs”, because I learned a long time ago that eggs should NEVER be boiled. Overcooking—as is frequently done when boiling an egg—causes that ugly green “halo” around the yolk. This green ring is harmless but doesn’t look very appetizing when making deviled eggs or serving hard cooked eggs. It is a reaction between the sulfur in the egg white and the iron in the egg yolk that occurs when the eggs have been cooked too long or at too high a temperature. These recommendations come from the National Egg Board (incredibleegg.org)—sadly, they call them “hard-boiled” too. I thought of all people they’d stress cooking not boiling. To hard cook eggs: place the raw eggs in a saucepan large enough to hold them in a single layer. Add cold water to cover eggs by one inch. Cook over high heat JUST to boiling. REMOVE from burner and cover pan. Let the eggs stand in the hot water for about 12 minutes for large eggs (9 minutes for medium and 15 minutes for extra-large.) 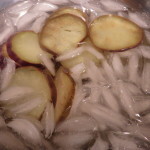 Drain immediately and serve warm or cool quickly and completely under cold running water or in a bowl of ice water. If you don’t cool them quickly you may still get that green ring, because the eggs continue to cook inside the shell. Store the cooled eggs in the refrigerator. Although we all frequently think of decorating with eggs….if you want other “Easter ideas” check out our Easter Rabbit Fruit Salad. And see our fun article, 5 Things We Love About Peeps. Place ingredients in glass bowl or measuring cup that is deep enough to submerge the eggs. Allow the eggs to set for 5 to 8 minutes depending on the color intensity desired. Remove with a fork and allow to dry on a rack. You can use crayons to make patterns on the eggs. And you can re-dye eggs again for various color combos. Store in the refrigerator until ready to eat. They make fun after-school snacks and can be used on salads during the week. Cooking with kids not only provides a family activity but teaches lifelong skills. Kids love to help and (of course) sample the products. It’s hard for kids (and adults) to resist eating the raw cookie dough or lick the beaters when making cakes or chocolate brownies. 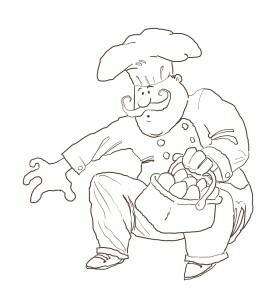 A food safety lesson you can teach early is that foods containing raw eggs should not be eaten—no matter how tempting. Raw eggs may contain Salmonella bacteria that could result in a food-borne illness. Salmonella can cause illness in anyone, but children who have undeveloped immune systems are especially vulnerable. I’ve seen advertisements in cooking magazines for pasteurized eggs. 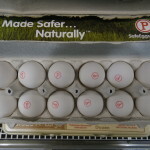 While these products look like and can be used like regular “shell” eggs, they have been heated to kill any potential bacteria. 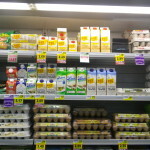 Other sources of pasteurized egg products include whole-out-of shell eggs (liquid eggs—frequently used in restaurants) and low-cholesterol egg products (made primarily with egg whites). These pasteurized products are great if you want to use a favorite family recipe that calls for an uncooked egg such as egg nog, hollandaise sauce, homemade mayonnaise and uncooked ice cream. Another option is to search for “reformulated” safe recipes. We have a banana nog recipe that offers an eggless, low-cholesterol and low-fat alternative to an egg nog made with raw eggs and lots of cream. While the ads for pasteruized eggs say it’s OK to lick the spoon, younger children may not be able tell the difference between products made with raw “regular” eggs and those made with pasteurized egg products. A good rule-of-thumb is that no one should eat uncooked dough or batter.